Around 400 students from leading universities and colleges in Metro Manila held last November 14 a demonstration dubbed “Busina Para sa RH” (“Blow Your Horn for RH”) in support of the reproductive health bill. 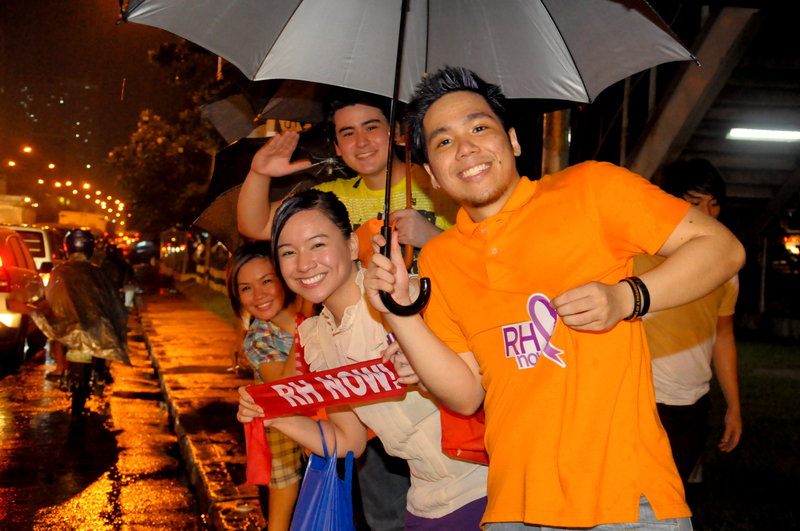 The pro-RH activists converged in Katipunan Ave., along the gates of Ateneo de Manila University, at 6 PM – to coincide with the opening of the legislative sessions in both Houses of Congress for that day. This entry was posted on Thursday, November 24th, 2011 at 8:30 am	and tagged with Busina Para sa RH, Gibby Gorres, Neptali Gonzales Jr., reproductive health, RH Bill, Student Council Alliance of the Philippines and posted in education, journalism, philippines, women's rights. You can follow any responses to this entry through the RSS 2.0 feed. I’m pro RH Bill. That’s all! Me, too. Sir, I’ll soon be writing about the Occupy for RH event last night. I agree that the government needs to address both number 1 and number 3. But a government with trillions of foreign debt has no business legislating numbers 2 and 4. The argument here is not about whether these problems should be addressed or not – of course they should be. But the question is, do we really trust the government to take on a national issue (that mostly deal with personal choices) that will cost taxpayers billions of pesos? I think many people brush off this point or so simply make it a sidebar but this is the main issue. We do not have enough budget to sustain our current projects. This is why PhilHealth is going to increase OFW payment by 150% and BIR wants to tax government contributions by 22%. Do we really want to give more money to a government that does not know how to live within its means to take on a personal issue? When was the last time the government managed the taxpayers’ money properly? The thing is, RH Bill is another way of expanding government jurisdiction that will justify another increase in taxes. Aren’t you tired of spending only what you earn but your government doesn’t? RH Bill is a great idea for an ideal government. This is not the time for us to be gambling billions of pesos on a legislation that may or may not be effective on an issue that the government should not be meddling with. Obviously, the concerns you raised about government spending is a valid one. I hope RH bill advocates would be able to come up with financial estimates or projections about the costs of implementing the requirements set by the bill. The government is not legislating the answer to number two. That would be addressed by including reproductive health education in the school curriculum. The issue of abortion is one thing I hope I can expound on a future post. I believe in a small fiscally conservative government. By that, I mean it is better if they pass laws that does not incur costs. For example, single people without any dependents should get a higher tax break than those with more dependents. They should pass legislation along those lines – encouraging less children and discouraging more by incentives and burdens, respectively. Nice idea. I agree with you on that. Maybe some of our lawmakers can think of crafting a bill that goes with that. The debate in government spending here in the Philippines hasn’t reached the level the topic has attained in US. Hope it will someday.